Building an Alexa skill really isn’t so hard! And it’s even easier if you use the Serverless Framework along with the Bespoken Plugin. To show you how, we’re going to take you through the steps of building your very own Alexa skill, by making a simple guessing game. 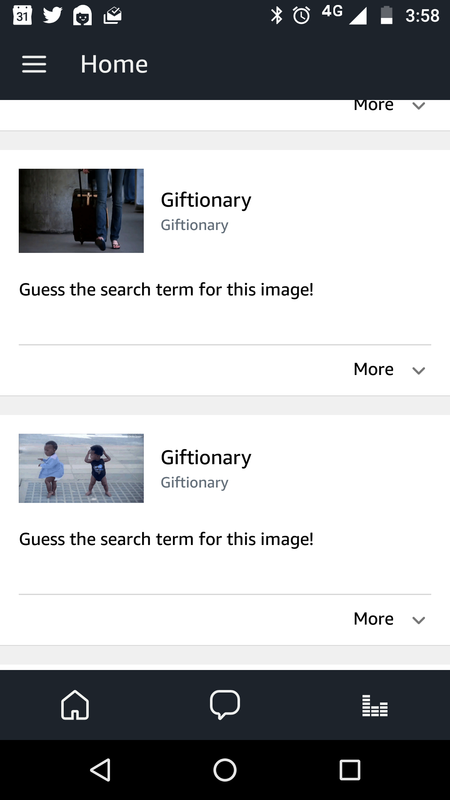 The game will pull some images from Giphy, then ask users to guess which search term generated those images. Go ahead and get set up with those items if you have not already. This repository contains the example we are going to walk through, already configured with the correct packages and libraries. 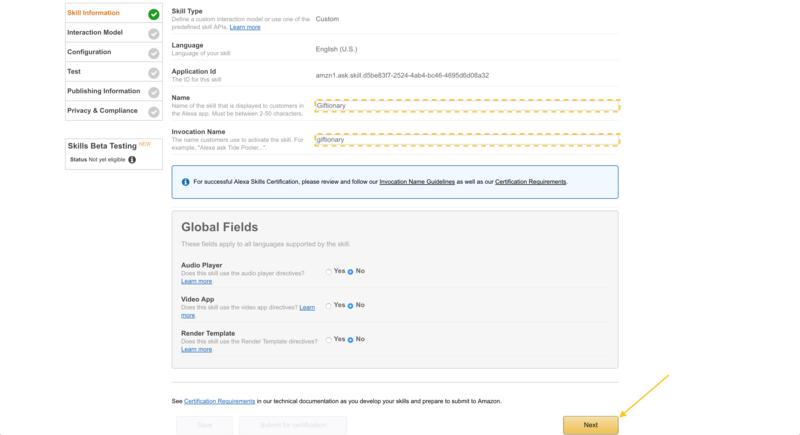 This includes the Alexa Node.js SDK from Amazon that we’ll leverage for building a skill. Once you’ve cloned the repository, go to the directory you cloned it into and run npm install to setup the project. That will install our dependencies. Just one more thing—while we are in the terminal, go ahead and run sls proxy. That will start the Bespoken Proxy, which we will use in just a bit. We’re now ready to start development! If you feel like you understand sessions and interaction models pretty well, feel free to jump straight down to State Machine, which is where we begin creating our first skill response. A session is a conversation between a user and our skill. It starts when the user invokes the skill by saying something like “Alexa, open giftionary”. 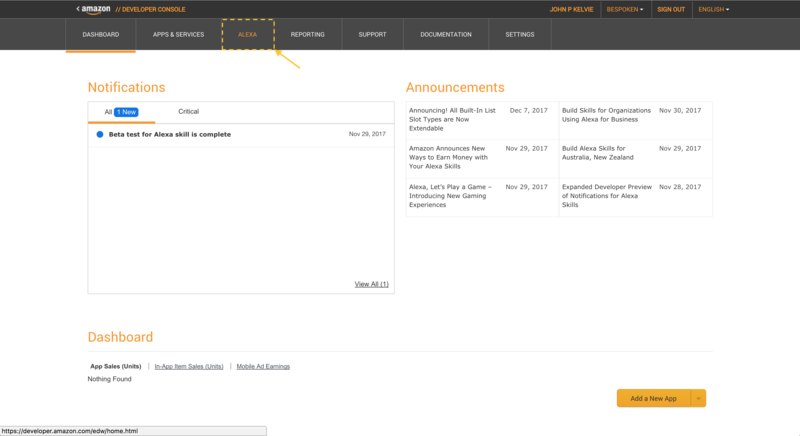 As long as our skill is in session, it has the chance to share information with the user via voice and visual elements, and/or ask the user questions. In thinking about voice design, it’s important to keep in mind how to keep the user engaged and keep the session alive so that the skill can do its job. Another very important aspect to understand with Alexa skills are intents and the interaction model. Intents are essential to the interaction model and Alexa, and to voice- and AI-based programming in general. For example, a user could say any one of the following: “Help me,” “Help,” or “What is this?” Alexa will interpret all of these as being the Help intent. This directly affects which pieces of your code will run. This is our Play intent. You can see that we have multiple sample utterances defined for it—“play,” “get started,” and “play a game”. All of these show up as the Play intent, which in our code triggers a game to start. Below is another intent, this time containing a slot. In this case, our slot captures the user’s guesses. Since our search terms are an enumerated set, we provide the list of values possible in speechAssets/TermsSlot.txt. The values are things like cat, dog, plane, etc. Besides being enumerable, slots can also have types, which serve to narrow the values they look for. This helps with speech recognition. Examples of built-in types provided by Amazon are AMAZON.NUMBER and AMAZON.DATE. Note: You can read more about types here. 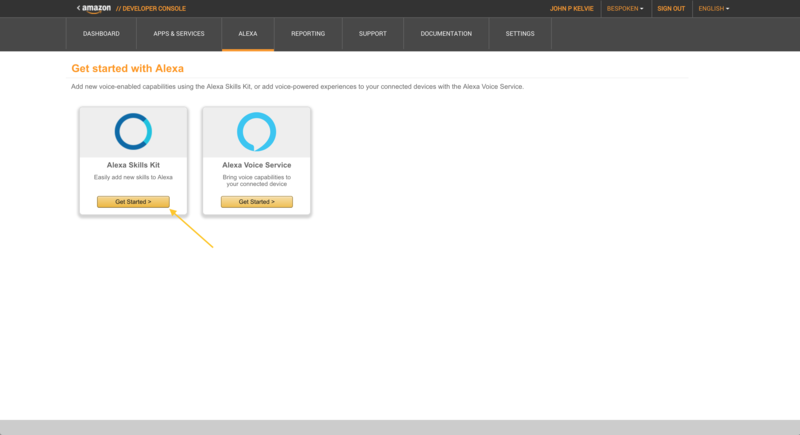 The Alexa Node.js SDK encourages the use of a state machine for building skills. State machines are a natural fit for skills (and other voice-based apps). The basic idea is that your app has states and transitions. Any action a user takes is handled based on the state they are currently in, and part of that handling may include transitioning to another state. This pattern pushes us to think about the discreet states the user will go through in interacting with our app, and how, for each of these scenarios, we will handle what a user might say. This mindset gets us thinking about providing appropriate, contextualized responses to the user, an important part of voice/conversational interfaces. Whenever a user starts a new session (by saying something like “Alexa, open giftionary”), this method will be called. Our code then checks to see if this is a new user or not. We leverage the built-in support for DynamoDB that is part of the Node.js SDK for this; user-level data is automatically stored on the attributes property. Additionally, these attributes are passed back and forth to our skill as long as it remains in session, and then persisted to DynamoDB when the session ends. For new users, we change their state to HELP mode. This explains to them how the game works and asks them if they would like to start playing. For existing users, we skip straight to the PLAY mode. Now that we’ve worked through the basics of our state machine, how do we actually reply to the user when the game starts? The key thing to look at here is the speak method: “Take a look at this image What is the search term for it?” This is what we are actually saying to the user. And the part in the middle that looks like XML is actually an SSML tag (Speech Synthesis Markup Language). SSML is a very helpful tool for working with voice—it allows us to insert pauses into speech, change the vocal tone, emphasize certain words, or even “bleep” things out. Feel free to read up a bit on SSML here. The listen part means that this response is going to wait on the user to respond. If they do not, it will reprompt them with the specified text. Now that we have a basic working skill, let’s test it out locally! To do this, we’re going to run our proxy via the Bespoken Serverless plugin. 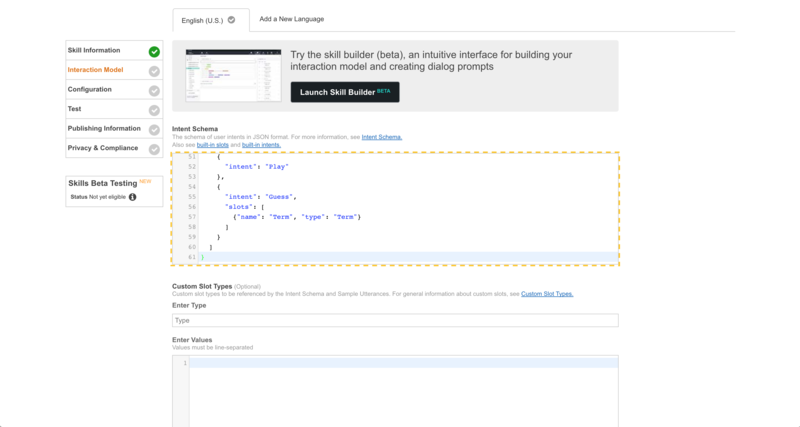 This plugin allows us to interact with a skill on our laptop without deploying it to Lambda. It saves a lot of development time; even though Serverless makes deployments a lot easier, it still takes time to upload our Lambda file with all its dependencies to AWS. 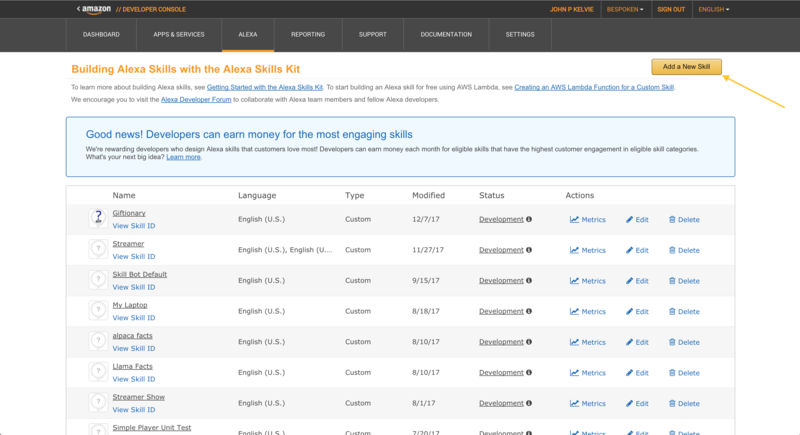 Before we go further, we need to set up our Alexa skill in the developer console. Under “Custom Slot Types” -> “Enter Type”, put “Term”. Then copy the contents of speechAssets/TermsSlot.txt to the “Enter Values” section, and then click “Add”. Copy the contents of speechAssets/SampleUtterances.txt to the Sample Utterances section. And with that, you’ve set up the Interaction Model! 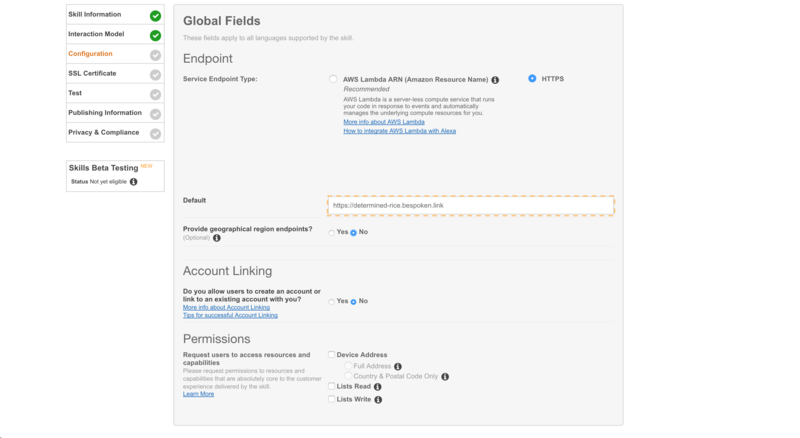 Select “HTTPS” for Service Endpoint Type. We are going to use Lambda for deployment, but for local testing we’re using the Bespoken endpoint. 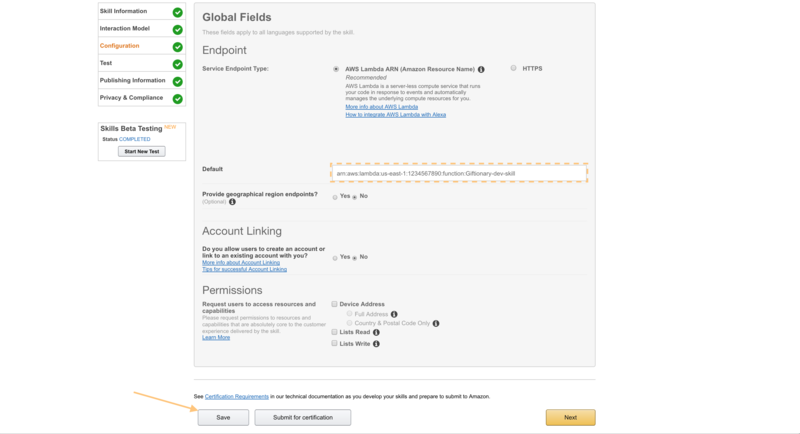 Under “Certificate for DEFAULT Endpoint”, select “My development endpoint is a sub-domain of a domain that has a wildcard certificate from a certificate authority”. The same request and response from the “Service Simulator” is now in our terminal window. Neat, huh? And we are not limited to testing via the Service Simulator. At this point, any Echo device can be used for testing. Tools like Echosim.io and the Reverb app will also work. Now that we’re completely set up, let’s do a real deployment! This step is easy; just open up your terminal and type sls deploy. Once that completes, we’ll need to update our skill configuration. Remember, it’s still pointing at our testing URL. We want to point it to our new Lambda instead. Now our skill is all set to be used by others! I'm John from Bespoken, so feel free to reach out if you have any questions. 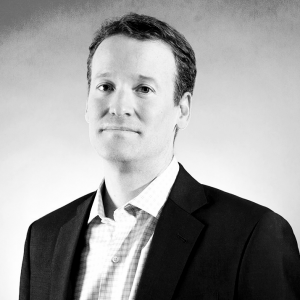 John is Founder and CEO at Bespoken—Makers of Voice App Monitoring and Testing Tools.